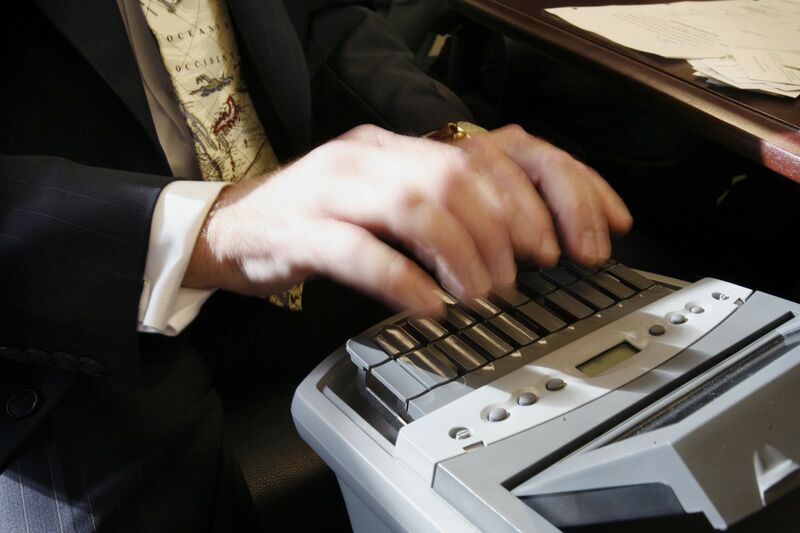 A court stenographer at work. There are times in court when Qawi Abdul-Rahman, a Center City-based defense attorney, gets the sense that folks listening didn’t understand a piece of testimony. “You get it all the time, truthfully,” Abdul-Rahman said. He’s been concerned that the true meaning of statements like “I don’t fool with them” glide past the ears of listeners who aren’t black. The unaware might think the speaker has a problem with someone. But saying this doesn’t necessarily imply hard feelings — it means the speaker isn’t really in someone’s circle. New research confirms his hunch. For a forthcoming study in the journal Language, researchers evaluated how well Philadelphia court reporters transcribe dialect. The team, which includes University of Pennsylvania linguists, a New York University sociologist, and a co-founder of Philadelphia Lawyers for Social Equity, tested 27 court reporters for both accuracy and comprehension. Roughly 40 percent of the sentences the court reporters transcribed had something wrong. Sixty-seven percent of attempts at paraphrasing weren’t accurate. And 11 percent of transcriptions were called gibberish. In Pennsylvania, court reporters must reach a 95 percent accuracy level to be certified. A team of researchers asked Philadelphia court reporters to transcribe these phrases from African American language. The chart on the right shows the linguists’ translations into mainstream American English. Legal experts say the findings have disturbing implications, as they raise questions about the accuracy of Philadelphia court records and on fairness within the justice system. The paper points to a 2007 dissenting opinion from a judge in the U.S. Court of Appeals for the Sixth Circuit. The judge had listened to a recording from a 911 call and argued that it was not possible to know whether “he finna shoot me” was present or past tense. (“Finna” is a contraction of “fixing to.”) But the judge made a grammatical mistake: In African American English it is impossible for “he finna” to be in the past tense. The judge had consulted the site Urban Dictionary. There is a common misconception that when you hear African American English, the speaker is using poor grammar. This stigma persists despite linguistic research and ample evidence that the dialect — and its regional varieties — follows grammatical rules of their own. Linguists note that many phrasings in African American English are camouflaged: The words may seem familiar in mainstream English, but in dialect, they act differently. For example, with a sentence like “Don’t nobody go over there,” intonation tips whether it’s a command or an observation that no one goes to that particular place. Jessica Kalbfeld, a doctoral candidate in sociology at New York University and co-researcher on the study, argues that since the dialect has been spoken in the United States for centuries, African American English speakers have “a very reasonable expectation” to be understood in the court system. “They’re not getting the benefits of those rights, because people aren’t understanding them and don’t even know that that’s happening,” she said. An undereducated ear might struggle with African American English because its speakers encode their words with distinctions of mood and tense that don’t exist in standard American English, said another co-researcher, Taylor Jones, who is a doctoral candidate in linguistics at Penn. Grammar in the dialect, Jones noted, can be more complex. When looking at test performance, black court reporters, who were roughly 26 percent of the sample, scored higher at paraphrasings and made fewer mistakes around syntax, but their transcriptions weren’t more accurate than their counterparts'. Across races, court reporters shared negative views of dialect. Researchers also tested seven lawyers, three of whom spoke African American English. In contrast, black lawyers scored much higher marks than attorneys of other races. Philadelphia court protocols instruct transcriptionists to ask for clarity if they have doubts about what they’ve heard, but many court reporters told researchers they felt discouraged from doing so. Legal experts say the volume of potential appeals that may rest on misunderstood testimony is difficult to estimate. For each instance, it would be a question of whether a transcription error impacts a pivotal detail in the case. Chief defender Keir Bradford-Grey said the Defender Association had been unaware of how deep issues of miscomprehension run. She’d been familiar with the "lawyer dog” case: In October 2017, the Louisiana Supreme Court declined the appeal of a man who had been quoted telling police, “Why don’t you just give me a lawyer dog.” A justice on that court wrote that the man had not made a clear request for counsel, arguing that “lawyer dog” was “ambiguous,” as if, reports noted, the man could’ve been asking for a pet. Confusion around tense elevates concerns over accurate transcriptions of an event’s timing. Jones said the researchers didn’t have a “specific answer” for why black court reporters, in contrast to black lawyers, performed as they did, but said it’s possible that social differences and enduring disapproval of African American English, even among black people who speak it, may have influenced those outcomes. The study’s researchers are against bringing in translators for African American English speakers. Rather, they argue that accuracy in the dialect should be tested in the court reporter certification process, alongside mainstream English. Following this report, the researchers plan to study how Appalachian English, another American dialect, gets handled in courtrooms. Bradford-Grey sees a need for more education for court reporters but also around the justice sector. “We need to be self-aware that this is a barrier [to how to serve] segments of the population,” she said. Abdul-Rahman has noticed layers of miscomprehension that may be linked to race, but also to what he detects as class, neighborhood, profession, or religion. It falls to the attorney, he explained, to translate and get moments of misinterpretation into the court record. He might repeat his question to produce answers that sound more mainstream. He might start to explain different slices of vernacular himself. But if a prosecutor objects and a judge agrees that his efforts aren’t relevant, that’s where that ends.